Antoinette Mattioli Blazek, 98, of Milford, beloved wife of the late Thomas Blazek, passed away peacefully at her home on December 3, 2018. She was born on August 30, 1920 in Bridgeport, CT to the late Frank and Nancy Arciuolo. Antoinette or Nonni was a loving and devoted wife, mother and grandmother. Material things held little value to her, but her faith and love for God surpassed all. She accepted everyone for who they were and loved them faults and all. She was a rare example of a kind, quiet and empathetic human being that has become an all but lost combination of character in our current culture. She lived a century long life of tranquil simplicity in the beautiful community of Milford. From her childhood on Walnut Beach to her elder years and slow walks along Gulf Beach, she never lost appreciation for the beauty that surrounded her. Even in her last years, Antoinette found great joy in her plants, flowers, birds and desserts…especially cheese cake! Antoinette worked beside her sister and best friend Angie for most of her life as owner of Dorothy’s Beauty Salon downtown and as a volunteer at the Beth-El-Center cooking her favorite Italian dishes. The best night of the year, was Christmas Eve and Nonni’s famous crab and lobster sauce. 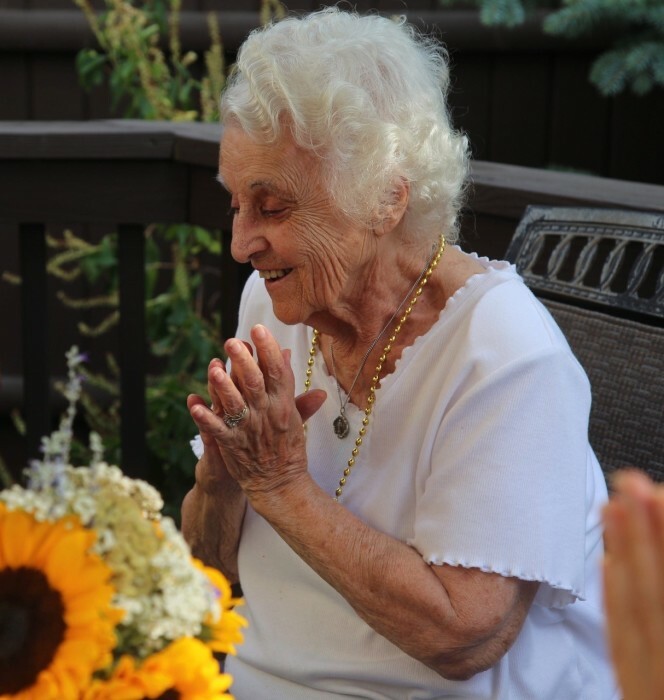 She created cherished memories and traditions that will live on in her family. Antoinette is survived by her children, Maurine and Ray O’Connell, and Carla Mattioli: her grandchildren, Raymond Michael, Heather and Tara; her great grandchildren, Rosettta, Robin, Sophie and Leo; her brother, Matt Arciuolo and wife Pauline; and several nieces and nephews who referred to her lovingly as “Honey Bunch”. Antoinette was predeceased by her first husband and love, Marino “Marty” Mattioli, and her siblings Madeline Greco, Angie West and Andrew Arciuolo. She was watched over with love and kindness in the last year of her life by caregiver, Cherry Guthrie. A Mass of Christian Burial will be celebrated on Monday, December 10, 2018 at 12 noon at St. Mary Church, 70 Gulf Street, Milford, CT. Interment will follow at St. Mary Cemetery, Buckingham Ave., Milford, CT. Should you wish to make a contribution in her name we would suggest the Beth-El-Center, 90 New Haven Avenue, Milford, CT.